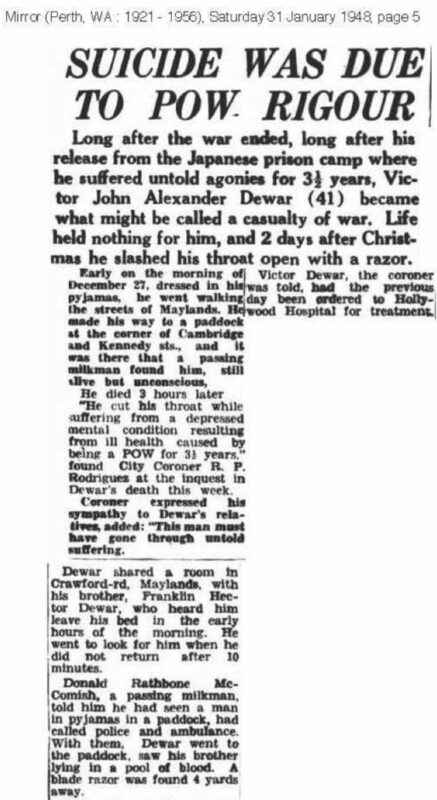 DEWAR, Private, VICTOR JOHN ALEXANDER, WX8238, A.I.F. 2/4 M.G. Bn., Australian Infantry. 27 December 1947. Age 41. Son of Samuel Sherman Dewar and Elizabeth Dewar, of Maylands. Grave Ref. Baptist Plot. Row BA. Grave 31. Vic’s parents married in Fremantle in 1898. His father was born in Victoria in 1865 died in 1921. Victor was the firstborn of two sons. Franklin Hector was born in 1907 Coolgardie. Vic was recorded in the 1931 Electoral Roll living in Maylands, his occupation was salesman. By 1937 he was living in Menzies and working as a mine employee. 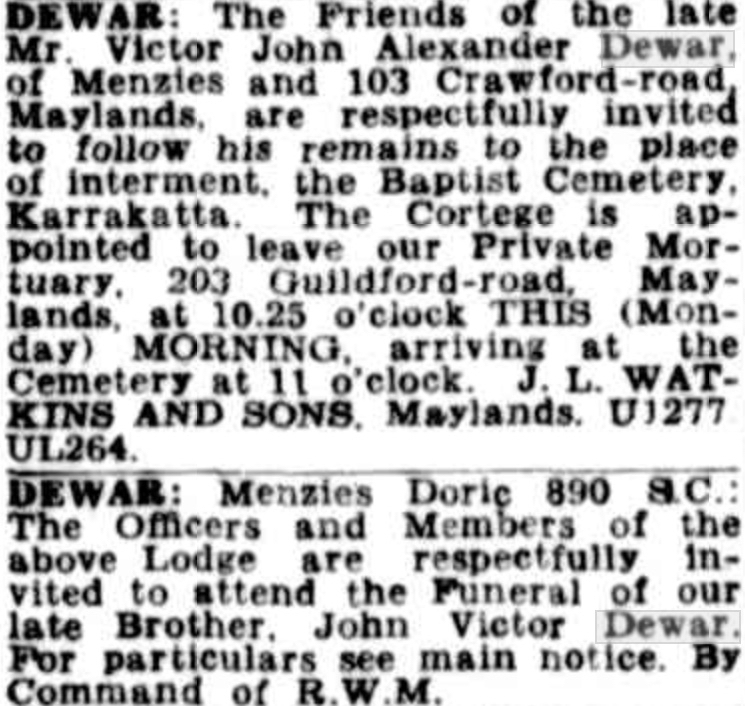 Lilly Dewar died in 1964, Maylands aged 87 years. 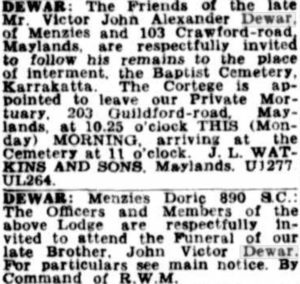 Franklin Dewar had married in 1934 and died Maylands in 1989 aged 81 years. Vic Dewar was selected in Singapore as a POW to work on the Burma-Thai Railway with ‘A’ Force Green Force No. 3 Battalion. Please read further about this Force. Following completion of the railway, POWs in Burma were sent south into Thailand, many were ill and some too ill to be transported and died in Burma. The journey was hell, and for those sick men it became their last journey. Vic was sent to Tamarkan, Thailand. He may well have been ill when he arrived, however there are no records. He was then sent to Nacompaton which was originally constructed as a hospital Camp which again suggests he was ill, but we do not know. He was finally sent to Tamuang from where he was found at the end of the war. Vic made it home to Australia. The greatest tragedy was he was understandably unable to settle back into his life. At the end of 1947 Vic took his own life, too ill to realise the pain he caused his brother Franklin and his mother Lilly Dewar. His fight was over. Vic was 41 years old. 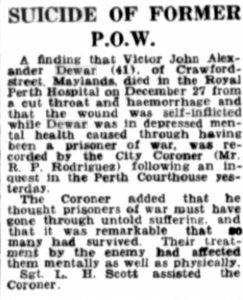 The Coroner’s words are of the greatest significance when remembering Vic Dewar and the other former POWs who were unable to find their way in life.